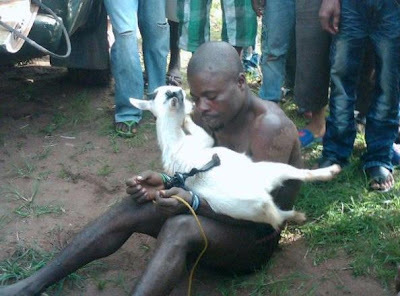 A MAN STRIPPED NAKED AND BEATEN TO A PULP FOR STEALING A KID GOAT IN NIGERIA DURING SALLAH FESTIVE PERIOD! SERIOUSLY PLEASE WHAT IS WRONG IN HANDING THE MAN TO THE POLICE INSTEAD OF THIS FORM OF ABUSE AND HUMILIATION HE IS BEEN SUBJECTED TO? WHAT HAS HAPPENED TO OUR SENSE OF REASONING,FEAR OF GOD AND HUMAN FEELINGS IN NIGERIA WITH THE WAY WE CALLOUSLY,WICKEDLY AND HEARTLESSLY BEHAVE TOWARDS ONE ANOTHER IN À EVIL AND VINDICTIVE MANNER, AS IF WE ARE ABOVE MISTAKES AND CAN NEVER BE A VICTIM OF LIFE CIRCUMSTANCES?? IS EVERYTHING SO PERFECT AND EXCELLENT IN OUR OWN LIVES THAT WE HAVE BECOME SO SELFISH,INSENSITIVE AND ABOVE ANY FORM OF MISTAKE THAT WE MUST PUBLICLY HUMILIATE AND EMBARASS ONE ANOTHER FORGETTING THAT GOD IS NOT SLEEPING BUT WATCHING, WHERE THE TABLE CAN TURN ON THOSE INFLICTING SUCH HURT AND HUMILIATION ON ANOTHER HUMAN BEING?? I AM NOT ENCOURAGING AND GLAMOURISING STEALING BUT I DO NOT BELIEVE IN JUNGLE AND VIOLENT JUSTICE THAT MEMBERS OF THE PUBLIC INFLICT ON ONE ANOTHER BY TAKING THE LAWS INTO THEIR OWN HANDS FOR TRIVIAL ISSUES LIKE THIS, VERY SAD AND DISGRACEFUL BECAUSE WE SHOULD BE MOVING FORWARD NOT BACKWARD AS A NATION! what do you think?